Understanding the different types of sports injuries that are possible is the first step in dealing with your own injuries. Until you know what is going on, you won't have a clear cut path to recovery. For serious injuries, you should see your family physician or another health care provider for a comprehensive evaluation. For minor aches and pains, this page is a good place to start to explore your symptoms and what may be going on. Listed below are common orthopaedic sports injuries that occur with sports. I start with general injury conditions, like tendonosis, bursitis, and swelling. These conditions can occur at many different places throughout the body. A serious injury is any set of symptoms or signs that have lasted for more than 5-7 days, that are causing significant pain (6-10 on a 10 point scale), that prohibit walking normally, or that have significant swelling or redness around the painful area. These signs and symptoms are suggestive of more significant injury and should be evaluated in person by a healthcare provider. I've also included injuries based on body parts. The whole SII website is organized based on different regions of the body. Within each section, I include information about anatomy, common sports injuries, treatment/rehabilitation, and surgeries. Below are the links to the primary injury sections for each of the main body regions. I've also included a limited section of common injuries based on sports. If you do can't seem to find the answers to your questions, or you need more information about an injury that isn't listed on the site, please contact me and I will add your injury to the list of new pages for the website. Swelling is often one of the first things we notice after acute sports injuries. Swelling can also be present with chronic conditions. Learn more about the causes of swelling, common treatments, and what it means to have swelling. Probably the most common orthopaedic injuries, sprains and strains constitute the majority of injuries suffered during sports participation, or with other activities. Learn what the difference is between a sprain and strain, what structures that are often injured, and how to classify severity. Tendonitis is a specific type of tissue pathology. Usually caused by overuse, this syndrome or injury is associated with pain, loss of function, and a high recurrence or chronic symptoms . Learn the signs and symptoms of tendonitis, common areas of injury, and viable treatment options. Bursitis is an inflammation of the bursa, usually associated with overuse and specific regions of the body. Learn more about the signs and symptoms of bursitis, common areas of injury, and viable treatment options. A fracture is a broken bone. While not as common as sprains and strains, fractures do occur in sports and with other activities. Learn more about the different types of fractures (stress, salter harris), and common bones that are broken with sports participation. Sport-related concussions are injuries to the brain that can occur when a person receives a blow to the head, or a strong force to the body. Concussions are a hot topic in the sports media, and can pose significant problems if not managed correctly. Learn more about this injury, common signs and symptoms, its treatment and management, and how serious it really can be. 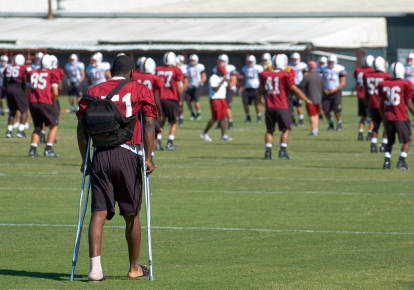 Ankle and foot injuries constitute the most common types of injuries in sports participation. Even minor ankle sprains can become long term problems without proper care. Read about the most common injuries that can occur at the ankle and foot. 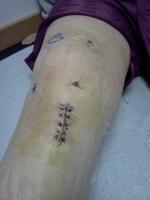 Includes patellar tendonitis/tendonitis, patella femoral pain syndrome, patella chondromalacia and many more. Learn more about these injuries to the knee. Hip pain is a common complaint with sports and recreational fitness participation. Injuries may include hip labral tears, hip muscle or tendon strains, and chronic conditions like bursitis and tendonitis. Shoulder injuries are very common in sports involving throwing or other overhead motions. Includes information on rotator cuff injuries, labral tears, shoulder dislocation, and other shoulder problems. Includes tennis elbow and ligament injuries. Tendonitis, fractures, and sprains are just a few of the most common wrist and hand injuries. Learn more about these and others. Kalynn Amadio from Lacrosse-Information.com provides an overview of the most common injuries that occur in lacrosse, as well as information about protective equipment. Please remember that the information on these pages is meant to help educate you regarding common sports injuries, and should not take the place of sound medical advice from a licensed physician, athletic trainer, or other healthcare provider. I regularly see patients that have been in pain for months, continuing to hope that "it will just get better". Usually, they end up worsening their condition, or just prolonging their discomfort. If you are in significant pain, have significant swelling or redness, or have symptoms that prevent you from walking normally, then the best course of action is to seek in person medical advice. Use the information on these pages to answer your questions, but go see your family physician or athletic trainer for an evaluation.